Abike Dabiri-Erewa wey be Special Adviser to Nigeria President on Foreign Affairs and Diaspora, say di frequent attacks of oda black pipo for South Africa fit provoke diplomatic wahala for di continent and also affect di unity. South Africa foreign minister hold meeting on Monday wit ambassadors of different kontris, afta attacks against foreigners inside Durban. 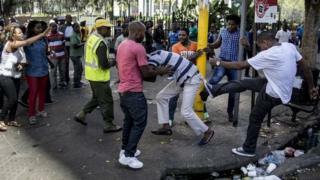 Madam Dabiri-Erewa say xenophobic attack for 2019 suppose shame and embarrass di South African goment. "I believe say Nelson Mandela go shame for im grave to know say dis kain tin dey happun," she tell BBC Pidgin. She add say oda African kontris don dey really patient wit South Africa and say dis na di right time for African Union to find lasting solution to wetin dey happun for di kontri. "If an African no dey protected for anoda African kontri, den we go soon be laughing stock among comity of nations. We all must dey worry on top wetin dey happun," she tok. For Bola Akintehinwa wey be former Director General of Nigeria Intelligence Agency (NIA), South African leaders and those for African Union don fail to find lasting solution to di problem. E say time don reach for African Union to jump enta di mata. "For dis attack to end, African leaders must stand up and begin to retaliate and to show South African pipo say no kontri be Island," im tok. Im say if oda African kontris under di African Union begin to sanction South Africa and dia businesses, dia eye go clear and dem go know say, e no be business as usual.